One of the most precious cooking spices in the world, saffron has a revered place in Spanish cuisine. Called Azafrán in Spanish, its sweetly pungent aroma infuses everything from paellas to lamb stews, roast suckling pig, soups, sauces, and even ice cream, making it an extremely versatile spice as well as a highly exclusive one; a single kilo of saffron can easily cost $3,000. Spanish saffron is a must in any gourmet kitchen. Gathered from the “saffron rose” or crocus flower, which blooms in late autumn, saffron is a difficult spice to obtain. Flowers are picked, by hand, on the day they bloom, representing back-breaking work for the harvesters. The blood-red, thread-like stigmas are plucked immediately for drying, which is often done in simple baskets over electric heaters. 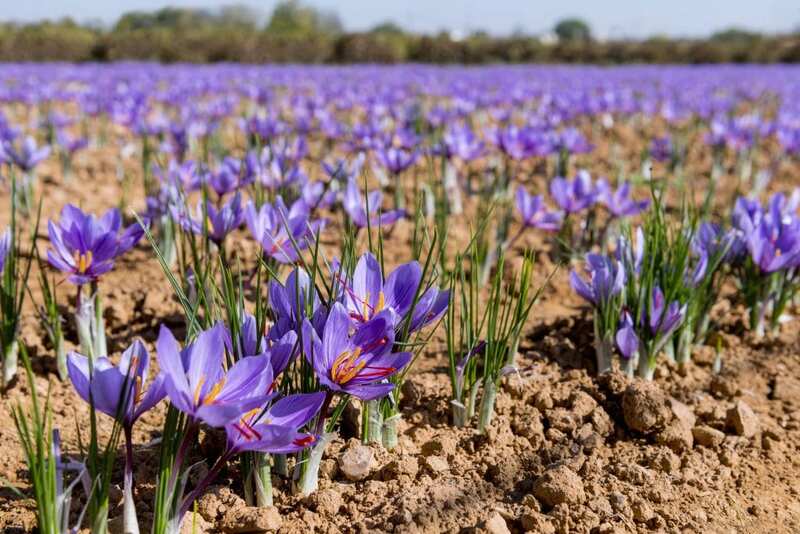 Since it takes some 250,000 crocus blooms to make a single kilo of saffron, the saffron harvest and preparation is a group affair, with friends or several generations of a family pitching in and helping with the work. It’s no surprise then that a gram of the spice costs more than $30. Although saffron traces its origins to Persia and is now widely produced in countries like China and Iran, the very best saffron is Spanish. This highly aromatic saffron comes from the fields of Castilla y La Mancha in central Spain. This is the land of Don Quixote. 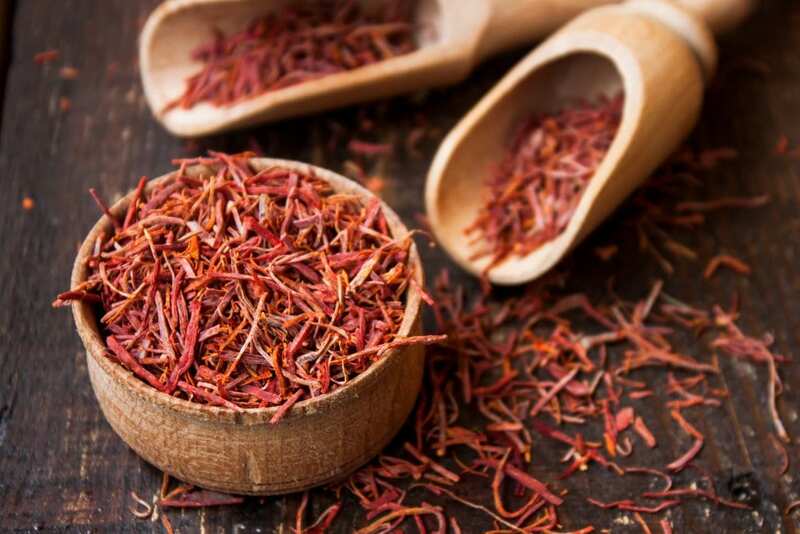 The only saffron in the world with DO, or appellation, status, it’s set apart by saffron produced elsewhere by its bright red color and explosive aroma; a little bit goes a very long way. Unfortunately, Manchegan saffron is hard to come by. During its heyday in the 1970s, production reached 50 tons a year, but regional economic hardships and a lack of quality control sunk production to just 100 kilos by 1998. The industry is struggling to get back on its feet and now 414 farmers produce a ton of DO-certified saffron annually, half of which is exported. Spain also exports as much as 100 tons of non-Manchegan saffron a year; much of it is merely packaged in Spain and shouldn’t be confused for genuine Manchegan saffron. Everyone knows that saffron can perk up a paella or soup, but that’s not the only reason to enjoy it. Saffron’s list of health benefits is dizzying long. It’s said to aid with digestion, strengthen the heart, combat contagious diseases, relieve coughs, clear liver obstructions, soothe babies’ teething problems, ease intestinal problems and even lower cholesterol. As with any food, however, saffron is best taken in moderation. Too much can upset your stomach or cause headaches, while a truly large dose (of several hundreds of grams) could be fatal. To maximize saffron’s flavor, experts say, grind the dried threads with a mortar and pestle, then heat them slightly on a pot lid or piece of tin foil before stirring them into your stew or sauce no more than 15 minutes before the dish is finished cooking. To enjoy the pure flavor of saffron, mix a few strands with hot water for a delicious and soothing saffron infusion. Store it in a cool, dark, dry place. For gourmet travelers, you can come to the picturesque town of Consuegra in La Mancha during the saffron festival, called “Festival de la Rosa del Azafrán”, in late October. This is a unique folkloric festival that offers a range of activities from contests to see who can extract the crocus the fastest, to processions of the masked Gigantes y Cabezudos (“giants and big-heads”). Other sights nearby include the many wineries of La Mancha, the beautiful village of Almagro with its ancient theatre and the castle of Alarcon and of course the stunning city of Toledo.